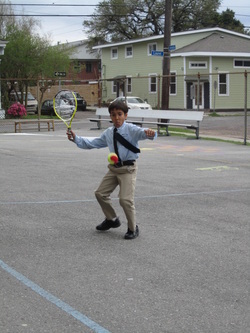 "A’s & Aces is a 501 (c) (3) non-profit organization whose mission is to provide academic assistance, life skills, and tennis instruction to New Orleans public school children in a safe and secure environment. The objective is to offer services to underserved children who are in need of quality assistance that will promote opportunities for their success." Little did I know that taking Intro to International Development as an elective course freshmen year would let me not only learn a lot about Kenya, but also get a chance to complete my service learning requirement with A's and Aces. It was probably one of the best and most fun ways to spend 20 hours of the semester. I was glad to come back as a staff member in the fall of 2010. So far it has been a lot of fun and also challenging as I've become a tennis and life skills instructor outside and in the classroom. Sophomore year, on Mondays and Wednesdays each week, I went to ARISE Academy and Arthur Ashe Charter School. At ARISE, I was the head instructor inside which has been not only enjoyable, but a fun challenge to instill valuable lessons about writing and life skills to 3rd graders that need help in all academic areas. 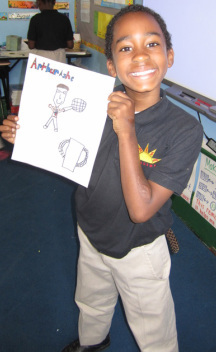 At Arthur Ashe, I coached tennis outside and assisted with the drills and games to get the kids familiar with sportsmanship and the lifetime sport of tennis. Our hope is that the kids will use some of their learned skills not only during our time with them, but also off the court and outside of the classroom. My Saturday mornings were also spent as a tennis instructor at Dillard University where the kids get more one-on-one practice and will actually start playing in some league tennis soon. While I was in Tanzania this past summer, I was e-mailed the exciting news that one of my students, Darnell, was chosen as a winner of the Arthur Ashe national essay contest we had worked on in the spring. With a free trip to NYC with his mom, I was so proud and happy to have been the ARISE instructor and am so glad that the students' hard work is paying off. Fall 2011 I was only able to do Arthur Ashe Charter School because I didn't bring my car down, but I was still happy to be teaching inside! Coaching the 8's and under tennis team was also a fun time every Sunday afternoon in Audubon park. It has been a lot of fun for me to make lesson plans and see what works and what doesn't when dealing with energetic, attention craving kids. Some days run a lot smoother than others, but I think as I gain more experience I will be able to make a bigger impact during the short window I get to interact with them each week.